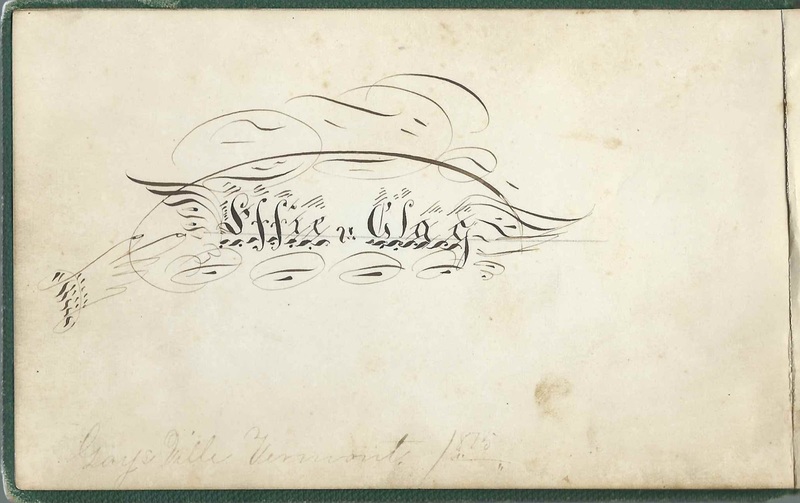 Autograph album that belonged to Effie Lucinda Clay of Gaysville, Vermont. 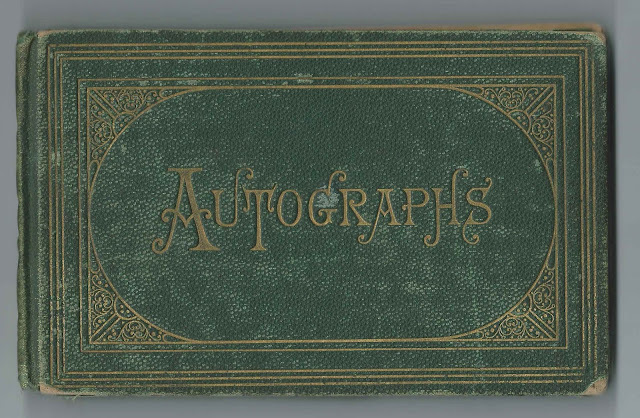 Effie dated her album 1875, but one inscription dates to December 1874. 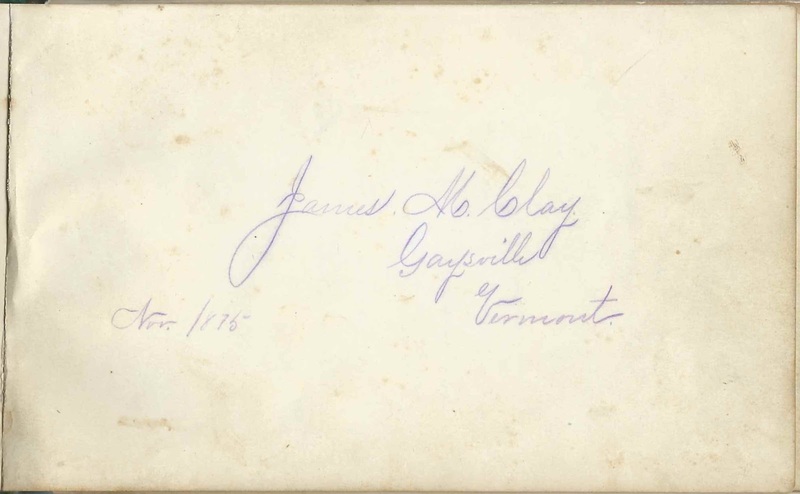 The album measures approximately 6-3/4" by 4-1/4" and contains the sentiments of about 113 of Effie's relatives and friends from Vermont, Massachusetts, New York, Ohio, Pennsylvania and Texas. An alphabetical list of the inscribers, together with any personal information they offered, appears at the end of this post. According to Effie's death record with information provided by her daughter, Effie Lucinda Clay was born May 31, 1861 at Pittsfield, Vermont, the daughter of James Mortimer Clay and Charlotte Temple (Orcutt) Clay. Effie's father, James Mortimer Clay, inscribed the first page after the pages inscribed by Effie. Effie's sister Jennie E. Clay also inscribed a page, as did Effie's Aunt Carrie of Bridport, Vermont. The P. E. Orcutt of Elizabethtown, New York, was presumably Perry E. Orcutt, whose father, George W. Orcutt, was a brother to Effie's mother Charlotte Temple (Orcutt) Clay. 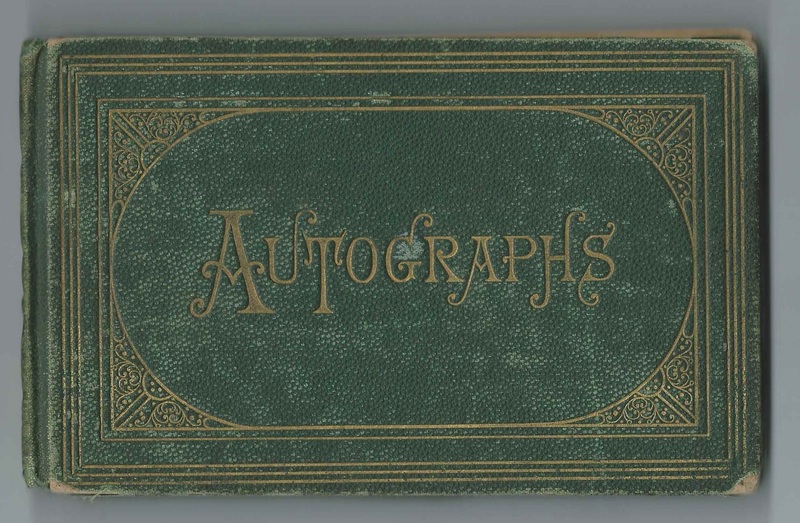 William T. Richardson, whom Jennie married on September 2, 1894; they had at least two children, Edward Clay Richardson and Nancy H. Richardson, both of whom inscribed pages in the album, as did William. 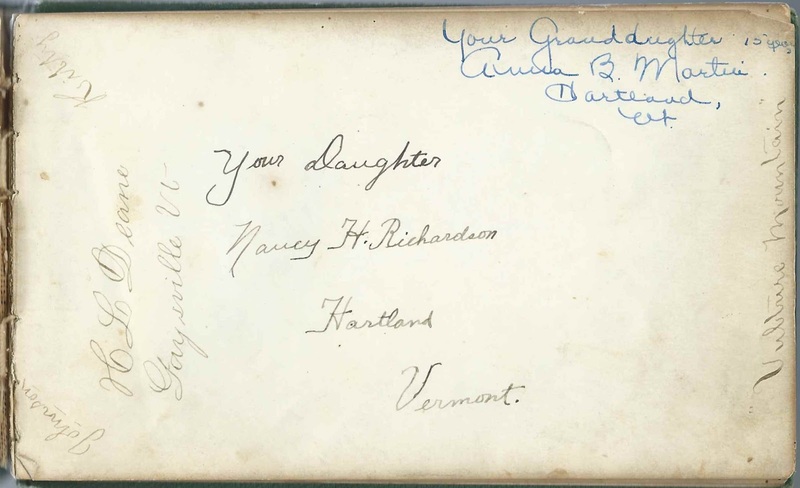 The page inscribed by Nancy H. Richardson was shared with her daughter Anna B. Martin and H. L. Deane. Anna's father was Alonzo A. Martin. Effie and William died in 1941. If you have corrections and/or additions to the information above, or information on any of the inscribers listed below, please leave a comment or contact me directly. Lucy Bigelow of Gaysville, Vermont; inscribed on March 16, 1876. The name Nancy in a childlike handwriting appears on the page. Carrie E. Headle of Hartland, Vermont; inscribed at Gaysville, Vermont, on January 25, 1878. Effie's niece, the daughter of inscribers Reuben W. Headle and Emma (Clay) Headle, who was Effie's sister. Emma C. Headle of Hartland, Vermont; inscribed on January 29, 1876. 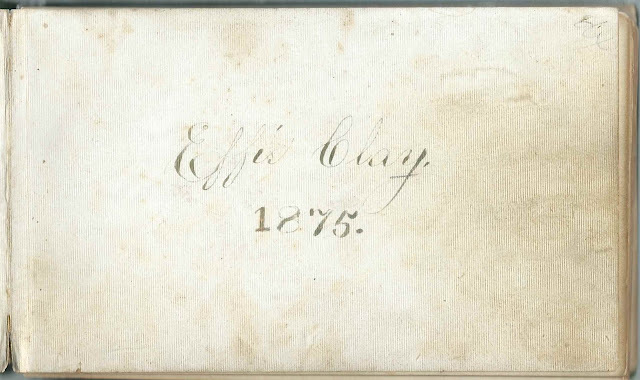 Effie's older sister Emma (Clay) Headle, whose husband Reuben W. Headle inscribed the left facing page. R. W. Headle of Hartford, Vermont; inscribed on January 29, 1876. Reuben W. Headle, whose wife, Emma (Clay) Headle inscribed the right facing page. Willie D. Headle of Hartland, Vermont; inscribed in March 1879. Son of inscribers Reuben W. Headle and Emma (Clay) Headle, who was a sister to album owner Effie Clay. Ida C. Knight of Boston, Massachusetts; inscribed at Gaysville, Vermont, on September 7, 1878. Mentions "Woodbury's potatoes"
Henry H. Nichols of Boston, Massachusetts. His wife, Jennie F. (Washburne) Nichols inscribed the right facing page at Rochester, Vermont. George E. Prescott of Moores, New York; husband of Ladilla J. Prescott, who inscribed the left facing page. Ladilla J. Prescott of Clintville, New York; presumably wife of George E. Prescott, who inscribed the right facing page. William T. Richardson of Hartland, Vermont; inscribed on February 14, 1878. 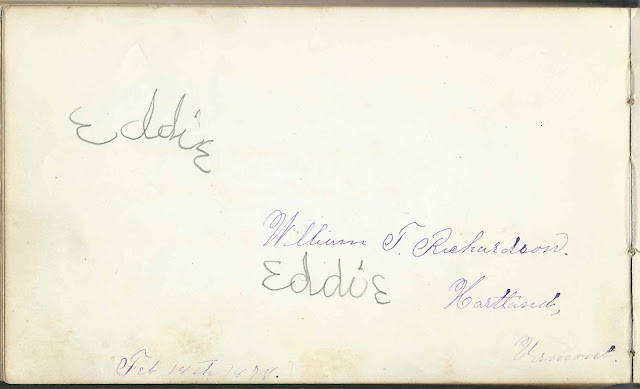 "Eddie" wrote his name twice in this page in a scribble. William was Effie's second husband; Eddie was their son Edward Clay Richardson. J. J. Saltery; sketched a basket of flowers. 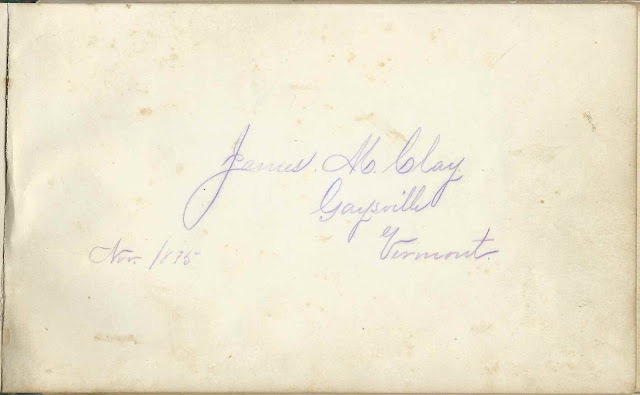 Presumably Julius J. Saltery, whose wife inscribed the right facing page as Mrs. J. J. Saltery.